I have long enjoyed growing plants and flowers including bonsai and roses. Here are two of my climbing roses. Both are antique rose varieties. 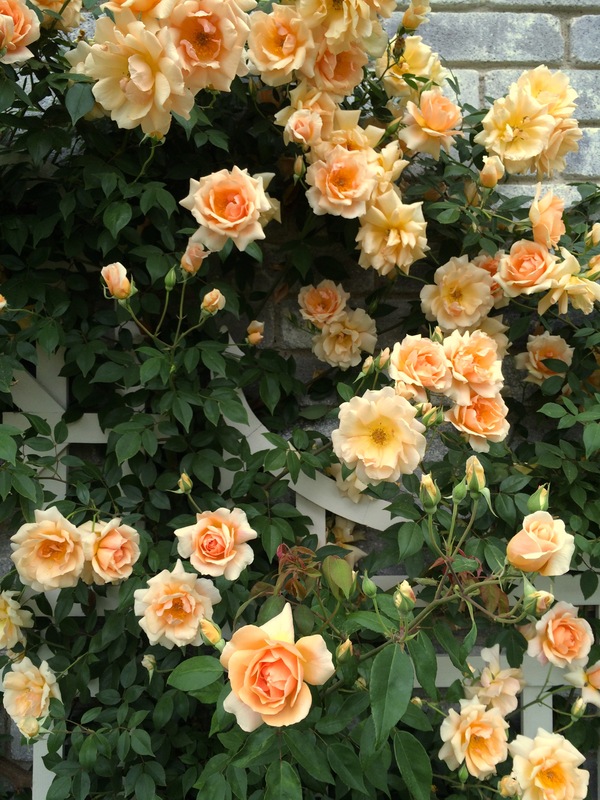 I love the creamy orange in the yellow “Crepuscule.” The pink rose is a “Parade.” The pink flowers are vibrant and larger than the Crepuscule blooms. Both of these roses made a wonderful show this spring. The Crepuscule grows on the south side. Picking up the sun’s warmth off the brick led it to be the early bloomer. 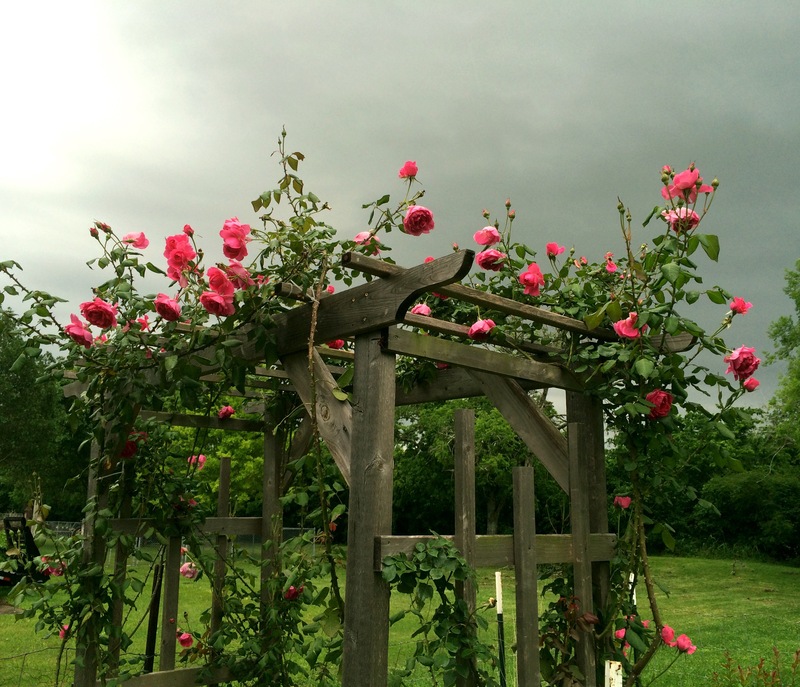 This rose produced well for several seasons. I let it grow without a great amount of trimming until last fall when I trained it more carefully on the arbor. The Parade rose has had a more difficult route. It is set as the centerpiece of a pink rose garden, also on the south side for best sun. I planted two plants with the intention of making an arbor. However, the deer kept stunting their growth. I finally had to put a wire fence around the garden to keep the deer out. Last summer I built the cedar arbor and trained the branches enough to get the first show this spring. I’m looking forward to many more years of beautiful roses on both varieties. However, I have white climbers on the northside which I may have to relocate. They are not getting enough hours of sunlight to produce abundant flowers. I haven’t decided yet where I want to transplant them. Roses are a rewarding hobby. They do require a bit of work, but the joy of beautiful blossoms is the payoff. I received training on growing roses from a horticulturist while I was in seminary. I worked for several years under him. He is now enjoying the greater glory of heaven. Thank you Carl for the gift. The lady who inspired my love for flowers is also with the Lord no doubt. When I was child, she lived in the house next door. A large wooden fence separated our yards. We thought she was a mean old lady because she would never return our errant baseballs. So one day I went to her house to ask why. She took me into her back yard. What we couldn’t see on the other side of the fence were beds of beautiful flowers. Our errant baseballs were damaging her flower beds, much like the deer were damaging my roses. Funny, she never called to complain. Maybe she kept the balls in hope to enlighten a soul to a new reality. That she did. This gracious lady began to teach me how to grow flowers. I guess every beautiful bloom I produce owes some debt to her. I wish I had better success with bonsai. Those words jumped out at me like a leap frog at a dinner table during Thankgiving. A little far fetched, I am sure. “There are certain elements of daily life which are not sinful in themselves but which have a tendency to lead to sin if they are abused. Abuse literally means “extreme use” and, in many instances, overuse of things lawful becomes sin. Ambition is an essential part of character, but it must be fixed on lawful objects and exercised in proper proportion. Thought about the necessities of life and taking care of one’s family is absolutely essential; but this can degenerate into anxiety, and then, as Christ reminded us, the cares of this life choke the spiritual seed in the heart. From the garden of roses and this devotion i can see the two intertwined. I have seen how the world can take away my joy and when fruit is not being produced when I allow the cares of this world to cast it’s shadow over me. There-in lies the danger. Over time the world takes from us life. It is not for the world to take but for us to share. Find it in your heart to spend time under “the Son” and allow the world to see such beauty of our Lord Jesus Christ and the love of the Father. If not, do not be surprised if the Master Gardener chooses to transplant you to produce abundant life someplace else.